The New Flexy is a cantilever parasol with a silver aluminium frame with a Sunbrella canvas. Sunbrella is solution dyed, UV resistant, and offers a high level of colourfastness. The Flexy has a twist mechanism for opening and closing the parasol, can be tilted, and is also available with lighting, electric operation with radio control, and an anemometer. 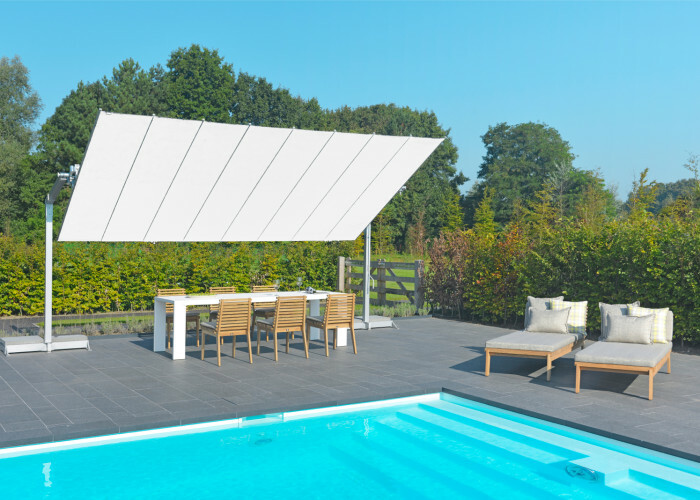 This New Flexy silver aluminium module is available in size 300×488 cm with a Sunbrella canvas in the colours white and sooty. Other sizes and colours are available on request. The New Flexy is supplied with a base and protective cover and can be combined with a concrete base or terrace base from the Borek collection.